I have a project that using api ivy.rules.engine to execute Drool rule, i just found a difference between Designer and Engine about the way it load rule package. I have two main folders: salaryReference and salaryCalculation, each of them has a child package called demo. When executing this code on Designer (Axon ivy 6.3.0.52421), it work exactly as i want. 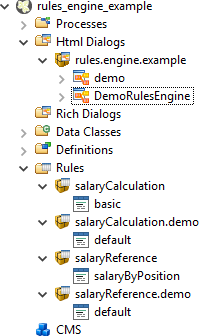 only rules from salaryCalculation/basic.drl and salaryReference/default.drl are loaded and executed. I don't see any logs from test rules. That a big trouble in our real project because we separate rule by packages and somehow expect rule engine will only load package that we set to them, non recursively. We created a ticket for your issue. We will investigate the problem as soon as possible. If this is a real issue, then it will be fixed in one of the next releases (currently the issue is put into version 7.0 backlog). If we cannot reproduce this issue on our environment. We will come back to you with more information. In the mean time, you can continue with your workaround by separating the namespaces.